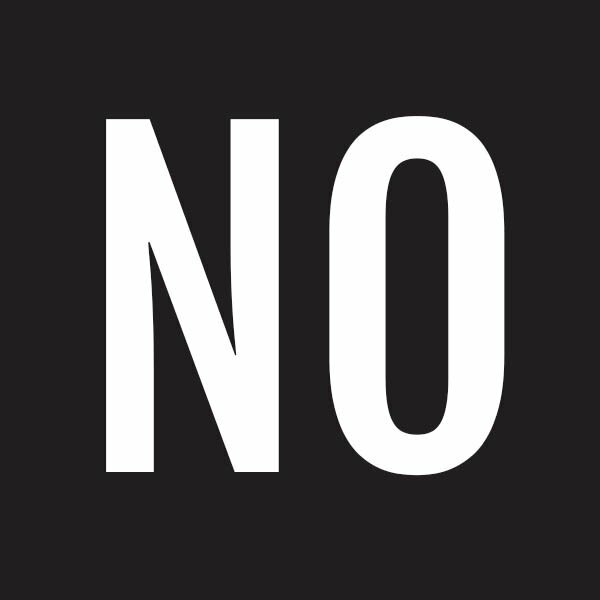 In case the photo is not clear, this is an image of a very large: "NO"
In case you need a little more information! At the end we cover how to get great engagement just like a personal page, without using underhanded dangerous tactics. Keep in mind when we say using a personal profile as a business, we mean creating a Facebook profile called: "Jim's Burgers". We definitely advocate using your own personal profile to network and grow your business…. with some caveats at the end that we will get to. This is a pretty clear reason not to do it. If you're found out, your account, and possibly your IP will be banned, meaning… you can't make another Facebook account without a lot of hassle. Most people know that personal pages are not supposed to be for business. So what does it say about a business that doesn't follow the rules? You will waste a lot of time and money in the long run. Let's say you somehow avoid the Facebook ban. Did you know there is a limit to how many friends you can add to a personal profile? Once you hit that limit, basically your only choice is to start over from scratch. Throwing away all the work you've done. Just because YOU don't think it's a problem, doesn't mean your customers won't. Most business owners I know, spend more time on their business, then they do on social media. So someone who doesn't understand social media very well might not think it's a big deal, but for your clients who do use social media all the time, they notice this stuff, and it's really off-putting. So you can use your personal profile to help your business. Networking in Groups: Join groups in your industry, or where your clients hang out. Be useful and talk about THEIR problems. Not your business. Sharing interesting and proud moments of your entrepreneurial lifestyle: Did something significant happen in your business life? Share that! People like hearing about your successes. But do you need to update your personal profile everyday on your business happenings? Nope. Adding key influencers in your industry. Reach out and meet people that you want in your business life. Nothing wrong with that! Especially if you both can mutually add value to each other's lives. Be careful not to make your personal profile all about your business. Good mental health is having a network of not just business associates, but friends and family that you interact with, and if all you ever talk about is you and your business and what you're selling… you will quickly find that support network of friendships disappear. It's true. Facebook has made the reach of your business posts go way down. If you put in a little effort and make a useful COMMUNITY GROUP, that is attached to your business page… you can get some great post reach. Facebook understands that people want to see posts from their friends, and things they are interested in. So the middle ground for a business is Facebook Groups. This is an entire post unto itself, but the long and the short of it is: Organic reach is still alive in groups. So posting there will get you the several hundred views per post that you used to get. While it is tempting to go for the short term gains of running a business through a personal page… know that you are investing time and energy not only into something that can get you banned, but also something with a shelf life that you will eventually have to replace. Better to focus on the long term goal, and reap the long term benefits then always living in the moment trying to get ahead. Should You Shift Your Traditional Marketing To Digital?